If you visit Louisville Label, you would be well advised to bring treats. Not donuts or a box of candy. Bring dog biscuits or bones. As president Anne Diemer explains: “Louisville Label is all about family—and dogs!” The family part of the company is easy to understand. The dog part takes some explanation. Louisville Label opened for business more than 100 years ago—in 1907. Founded by J. C. Burton, the company specialized in pharmaceutical labels, serving the many neighborhood pharmacies that once dotted this bustling Ohio River town. In addition to labels, Burton sold pharmaceutical devices like mortars and pestles to the same customers. The business eventually passed to Burton’s nephew, J. D. Stodghill. In the 1950s Stodgell hired Ted Diemer to handle sales and they began expanding the business beyond the core pharmaceutical trade by producing labels using flexographic presses. Some 20 years later, Diemer bought the company. Diemer’s daughter, Anne, bought Louisville Label in 1987 and today provides labels to all types of businesses in the Ohio Valley region. Label Traxx is used at Louisville Label for order entry, estimating, accounts receivable, inventory, and stock products. The inventory aging feature built into Label Traxx is augmented using color coded labels designed by the employees. With a different color label for each year and the remaining amount of stock printed prominently on the label, production personnel can quickly find the exact roll of stock they need for any job. Roll stock is kept on the shop floor for ready access. Louisville Label employees have found the standard reports shipped with Label Traxx to be sufficient for their needs. 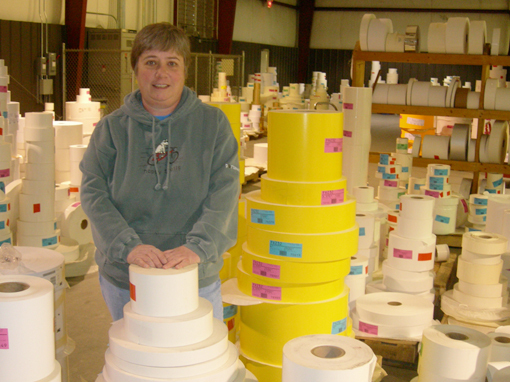 “At Louisville Label,” says Diemer, “we pride ourselves on our customer service. Label Traxx helps us provide good service because information about customer orders and history are so readily available.” The company has three outside salespeople calling on customers, supported by two inside customer service representatives. Field sales representatives occasionally access Label Traxx after they finish their calls for the day, but generally they rely on the customer service representatives, who do all estimating and are required to get only estimates exceeding a fixed amount approved by the plant manager. Label Traxx data are backed up daily and the backup file is taken off-site for safekeeping. Oh, about the dogs! Says Diemer: “Most employees have dogs, and are encouraged to bring them to work if they want.” Diemer herself had brought three with her to work the day we visited, and at times more dogs than employees could be seen in the building. On his afternoon break, the plant manager, Patrick Ourada, was seen walking his dog in the parking lot. The business has a collegial atmosphere in other respects as well. In the lobby is a photo of what Anne Diemer calls “the Golden Girls”—actually a number of women and one gentleman—retired Louisville Label employees who return for an annual reunion wearing bright yellow shirts. No mandatory retirement age exists at the company, and employees have been known to work well into their 70s before leaving. Louisville Label takes a family approach to work, and despite an abundance of pets, the business is definitely not going to the dogs. Louisville Label uses Label Traxx to make sure of that!